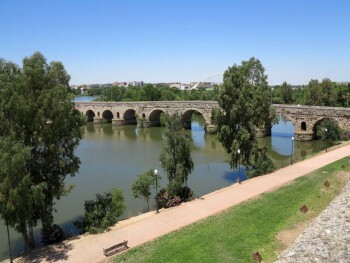 The Roman colony of Emerita Augusta (present day Mérida) was founded in 25 BC by Augustus, to resettle emeritus soldiers discharged from the Roman army from two veteran legions of the Cantabrian Wars: Legio V Alaudae and Legio X Gemina. The city was the capital of the Roman province of Lusitania. 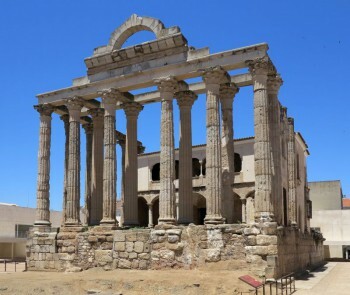 Today the Archaeological Ensemble of Mérida is one of the largest and most extensive archaeological sites in Spain and a UNESCO World Heritage Site since 1993. 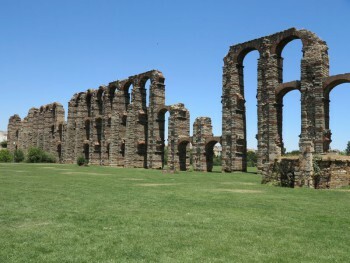 The arcade is fairly well preserved, especially the section that spans the valley of the river Albarregas. It is known by this name, because it seems a miracle that it was still standing. 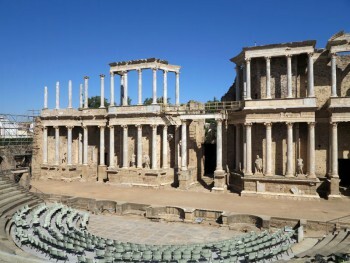 Rectangular, and surrounded by columns, it faces the front of the city’s Forum. This front is formed by a set of six columns ending in a gable. It is mainly built of granite. An entrance arch, possibly to the provincial forum. 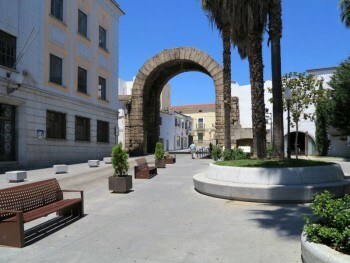 It was located in the Cardo Maximus, one of the main streets of the city and connected it to the municipal forum. Made of granite and originally faced with marble, it measures 13.97 meters high, 5.70 m wide and 8.67 m internal diameter. 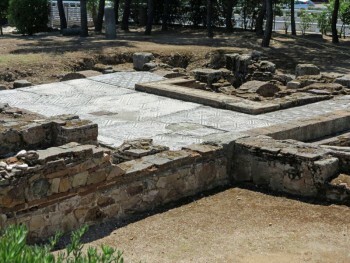 It is believed to have a triumphal character, although it could also serve as a prelude to the Provincial Forum. Immersed in the maze of modern construction and masked by nearby houses, this arch stands majestically and admired by travelers and historians of all times. Its name is arbitrary, as the commemorative inscription was lost centuries ago. This building was found fortuitously in the early 1960s, and is located on the southern slope of Mount San Albín. 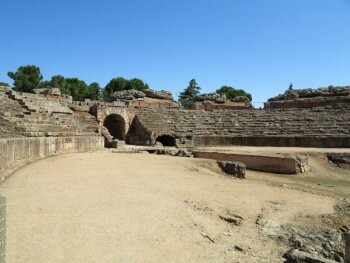 Its proximity to the location of Mérida’s Mithraeum led to its current name. The whole house was built in blocks of unworked stone with reinforced corners. It demonstrates the peristyle house with interior garden and a room of the famous western sector Cosmogonic Mosaic, an allegorical representation of the elements of nature (rivers, winds, etc.) overseen by the figure of Aion. The complex has been recently roofed and renovated. As mentioned above, it is not considered the actual mithraeum but a domus. The remains of the mithraeum are uphill from it in a plot corresponding to a current bullring. This site has rendered prime examples of the remnants of Mithraism. According to professor Jaime Alvar Ezquerra of the Charles III University of Madrid, the oldest mithraeum artifacts are observed outside of Rome and Mérida “is at the head of the provincial places where the cult is encountered”. These are currently located in the National Museum of Roman Art in Mérida, including the latest remains found in excavations as recently as 2003. He notes that some of the sculptures being discovered at the site are in very good condition, leading him to believe they were “hidden on purpose”.